Just as Alligator Al is planning the perfect birthday dinner for himself, there is a knock on his door. It's a delicious-looking piglet -- how lucky! But as Al prepares his feast, the piglet makes some suggestions. Shouldn't Al have a big birthday cake? Piglet can tell him how to make one. And wouldn't the celebration be more fun with fancy decorations and party guests? Piglet would be happy to ask some friends to come over. Al is so lucky that Piglet is there to help...or is he? Could Piglet have a clever party trick up his sleeve? 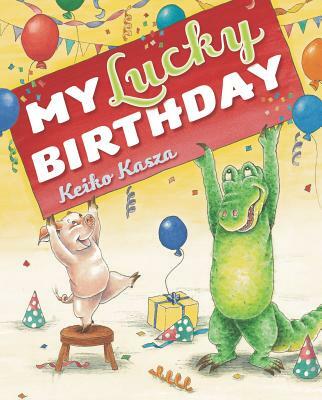 Fans of trickster tales, rooting for the underdog, and the proven crowd favorite My Lucky Day will be thrilled to see who turns out to be the lucky one in this hilarious book.